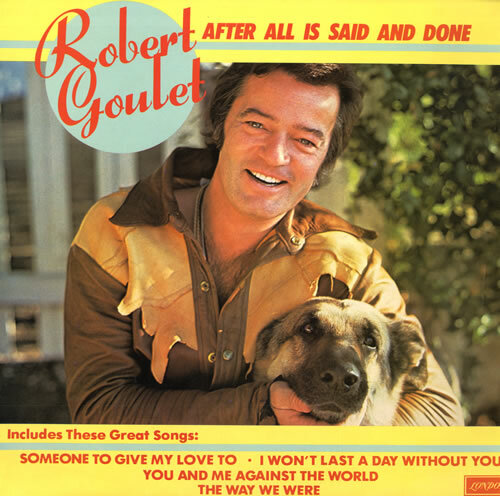 “Robert Goulet out, Steve McQueen in!” In addition to being name checked in Hello Twelve, Hello Thirteen, Hello Love, one of the great songs in Marvin Hamlisch and Edward Kelban’s peerless A Chorus Line score, singer and actor Robert Goulet might best be remembered for creating the role of Lancelot in Lerner and Loewe’s Camelot, for his starring role in The Happy Time, the Kander & Ebb musical which won him the Tony Award for Best Actor in a Musical in 1968, or for winning the 1962 Grammy Award for Best New Artist. He might be remembered for his roles in Louis Malle’s Atlantic City (1980), Tim Burton’s Beetlejuice (1988), or his guest starring appearances with Lucille Ball on The Lucy Show (1967), or Alice (a two part episode—no less—that aired in 1981). 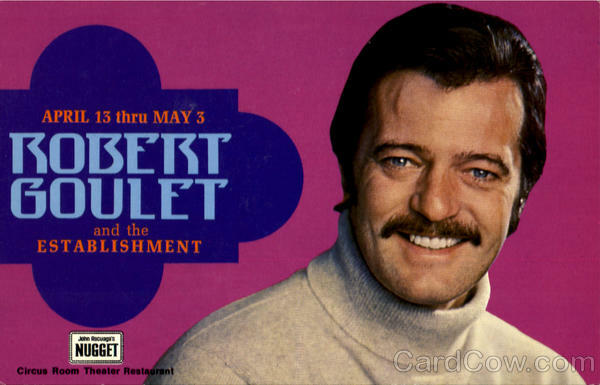 But you can be sure that the dashing Mr. Goulet, who died in 2007, will definitely not be remembered for his version of You and Me Against the World, which in its slick, jet age swagger manages to suggest a bottle of Vitalis hair tonic, the go-to hair product for the hypermasculine Kennedy-era set. The song was written by Kenny Ascher and Paul Williams, who gave us The Woman in the Moon and Watch Closely Now from A Star is Born (1976), and was a ubiquitous AM radio hit by Aussie lark Helen Reddy in 1975. In timely Alice Doesn’t Live Here Anymore fashion—the Martin Scorcese film was released the year before—Helen made the song about her kids (“I love you mommy!”), but Mr. Goulet makes it about something else: Las Vegas! 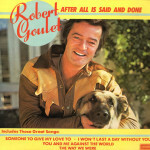 Indeed, in his resonant, pack-a-day Kent 100s baritone, the song evokes nothing as much as a long walk through the cavernous corridors of Caeser’s Palace at sunrise, after a misspent night at the craps table. Edith Massey—a.k.a. “The Egg Lady”—shot to fame as one of director John Waters’ muses, perhaps most memorably as an obese, egg-obsessed, toothless woman with who lives in a baby crib in a trailer in Pink Flamingos. 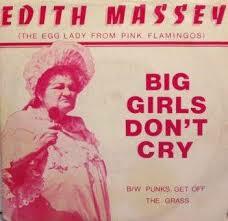 In 1982 she released a cover of the Four Seasons’ Big Girls Don’t Cry (backed with Punks Get Off the Grass) on an indie label called Egg Records (natch!). Edie had difficulty speaking, much less singing, so the fact that she basically gets through the Bob Gaudio chestnut is something of an accomplishment. I think the reason Edith is still beloved today isn’t only because of the Grand Guignol element of her work, though there is that, but because she brought a guileless authenticity to everything she did. There was a childlike quality to Massey’s presence, primarily in her zesty willingness to do whatever was asked of her no matter how outlandish, that is actually quite touching. So enjoy the great Edith Massey in all her Baltimorian glory, okay hon? Readers of Stargayzing know that I am an unabashed “Fanilow”, but for every musical gem Barry has recorded, for instance Mandy or When October Goes, is something regrettable like—well—like anything recorded after, say, 1990. 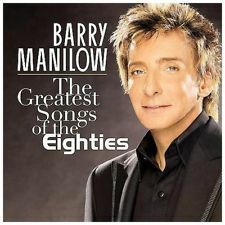 Though I have always given Mr. Manilow tremendous credit for essentially creating the “power ballad,” somehow he gets into trouble when he tries to cover other people’s power ballads: to wit, on his dismal opus The Greatest Songs of the Eighties (not to be confused with his other dismal opus, The Greatest Songs of the Seventies), Barry’s naturally schmaltzy inclinations, which can sometimes be so endearing, turn woefully—memorably—wrong as he applies them to other people’s schmaltzy creations. 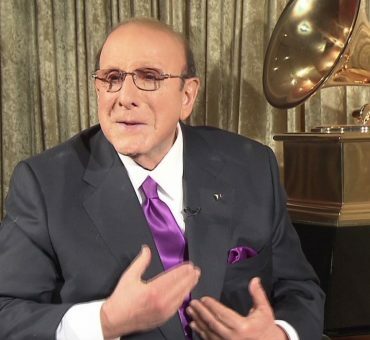 The Greatest Songs of the Eighties was recorded during Barry’s brief mid-aughts reunion with erstwhile Arista mentor Clive Davis, and the album just wreaks to the high heavens of Clive Davis “high concept.” On this album Barry serves up such a veritable smorgasbord of unbelievable cover songs that it was almost impossible to choose just one for you: and that’s just the 1980s volume! To tell you what I almost chose would rob future blog posts of their mojo, so let’s just say that when it comes The Greatest Songs of the Eighties, Stargayzing readers can look forward to much more kitsch from this kitchen! McCartney’s My Love was released as the first single from the Wings album Red Rose Speedway in April, 1973. It was a huge hit, peaking at #1 on the Billboard Hot 100 and at #9 on the U.K. singles chart. 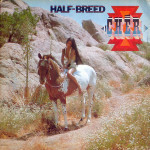 Cher’s version appeared later that year on her Half-Breed. 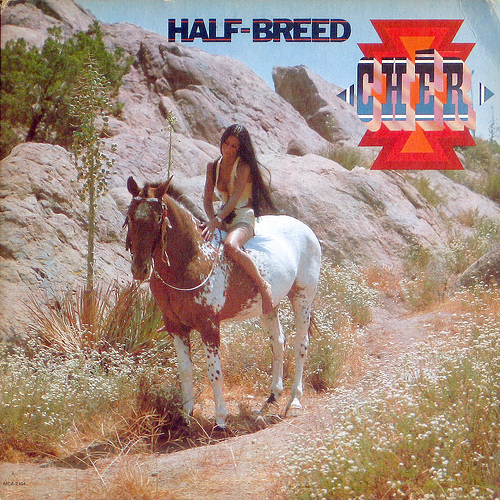 Though it was not released as a single, Cher did perform the song in her solo spot on the Sonny & Cher Comedy Hour in a stunning Bob Mackie ensemble. Stargayzing hopes that it can play a small part in ensuring that Cher’s My Love is rescued from the discount bin in the sky! 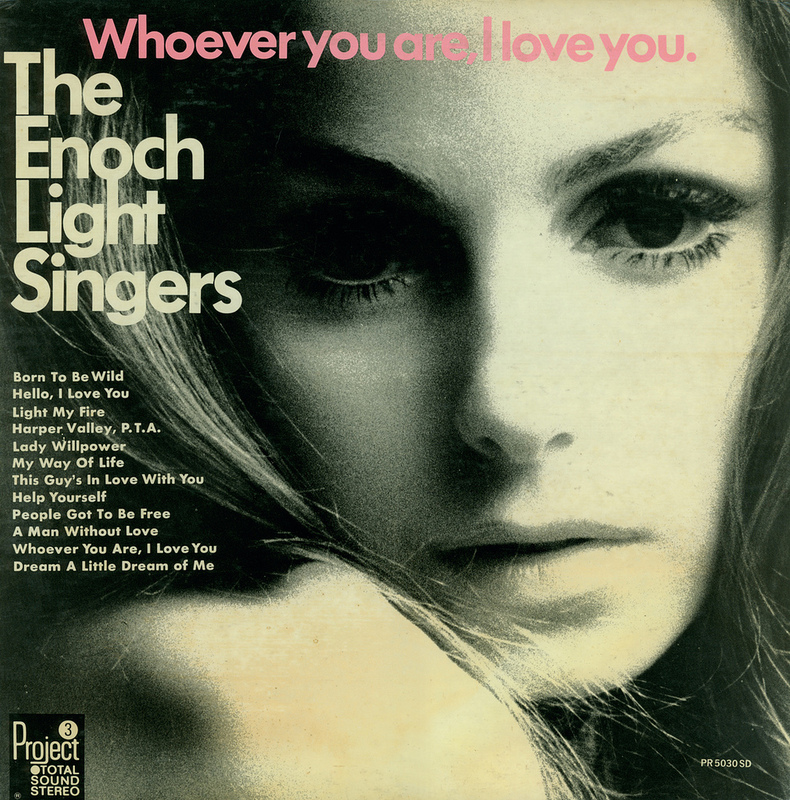 It might be hard for younger people to wrap their heads around the fact that Easy Listening music as exemplified by today’s unbelievable cover, the Enoch Light Singers’ version of The Doors’ Hello, I Love You was, once upon a time, not only popular but fairly ubiquitous. Though it would have skewed to a way upper demo even in its own day, Easy Listening enjoyed many years of great sales success right along side of rock ‘n roll. Though not taken seriously by the emerging youth culture, the music was so popular that it enjoyed its own radio format which, I would posit, served the same cultural purpose as today’s Smooth Jazz: to create a pleasing but unobtrusive sound bed. You know, the kind of music that you’re not supposed to actually realize you’re hearing but is meant to improve your mood, encourage you to shop, or calm you down when you’re put on hold. At the time, the music was generally reviled by younger folks, who derisively referred to it as “Lounge Music,” “Elevator Music,” “Dentist Office Music,” or the more corporate “Muzak.” The contemporary sobriquet “Loungecore” represents the co-option of the genre by hipsters and, ironically, has conferred upon it just the sort of credibility that it never achieved in its own day. Though Enoch Light’s music might titillate today—especially late-period choral confections like this—he was actually an accomplished musician, record studio wizard, and record business pioneer. Among his achievements, he is widely credited with being the first producer to fully take advantage of stereo sound in his arrangements and recording, was the first to record on 35 mm film as opposed to tape, and he invented the popular gatefold album covers to create additional space to elaborate on all of his studio innovations. This means that every teenager who ever cleaned a nickel bag of pot in a Pink Floyd gatefold album cover is unknowingly indebted to the maestro Enoch Light. 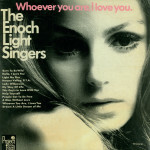 By the time Light released Whoever You Are, I Love You, the 1968 vocal album which contained Hello, I Love You along with a gaggle of other contemporary favorites equally ill-suited to perky choral arrangements, Light’s career was moving toward its final chorus or, if you will, Enoch’s twi-Light. 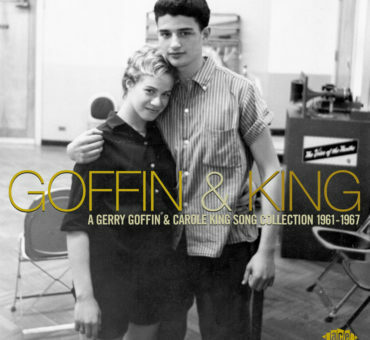 When I listen to this record, what I hear is the sound of older people feverishly working to mesh their middle-of-the-road style with the “now sound” and whip up something comestible to oldsters. The fact that this is intrinsically not possible makes for an enduring time capsule of misguided creativity. "Punks Get Off the Grass"
"The Greatest Songs of the Eighties"